Two TUF volunteers, Ken and Walter, have recently visited one of our partner schools. They shared their past learning experiences, in particular the challenges they encountered and the positive attitudes they adopted to overcome them, with S6 students. They also passed on some useful tips on DSE preparation to students and cheered them on. What’s more, the two passionate speakers have emphasized the ownership over one’s life and empowered students to pursue the things they truly wanted in their life. Students were not only inspired by Ken and Walter’s uplifting personal stories, but they also found their sharing practical and relevant to them. Most of the students were all ears during the one-hour sharing session. When it came to the Q&A session, students eagerly seized the chances to interact with our volunteers or seek advice on particular issues they concerned. In addition to the words of wisdom imparted by the speakers, our student helpers have learnt even more from the process of putting together the sharing session. 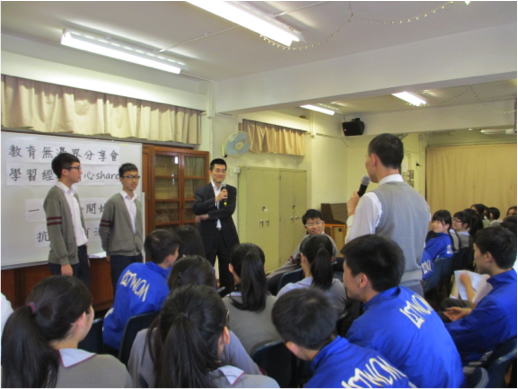 In order to bring the sharing session in line with the unique education approach– “Student Voice”– that the school adopts, which emphasizes students to be the centre of learning, nine students were invited to take up an active role in running the event for the entire form with around 160 students in total. No matter it was being the host that everyone paid attention to or working behind-the-scene such as preparing for the interview questions for the speakers, the student helpers all demonstrated real enthusiasm for their missions. Together with the training and assistance provided by our Program Mentors, the helpers, especially the quick-witted hosts, have brought their schoolmates a light-hearted sharing session with meaningful interactions and plenty of food for thought. Did you enjoy this experience? Why or why not? What is the ONE thing you learned or enjoyed most today?